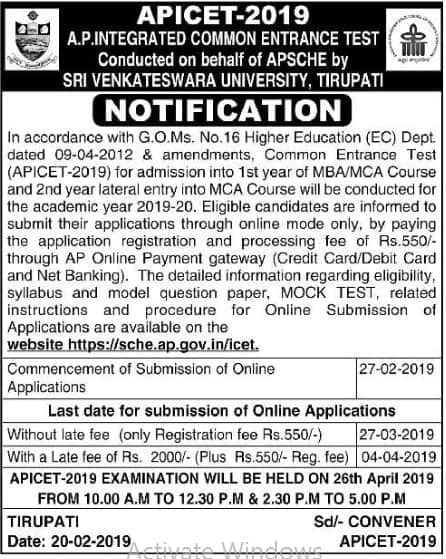 AP ICET Admission 2019: AP ICET for the academic session 2019-2020 will be conducted on 26th April 2019. Interested candidates can fill AP ICET online application form which is available on the official website to available from 27th February 2019. Candidates can get all the details related to AP ICET 2019 like exam dates, application form, eligibility criteria, exam pattern, syllabus, result etc from this article. AP ICET 2019 Registration will be started from 27th Feb 2019. Candidates are required to fill AP ICET 2019 application form only through online mode. Application through any other mode will not be accepted. For filling application form candidates have to visit the official website of the conducting authority which is mentioned above. Candidates can fill application form from 27th Feb 2019. Candidates have to submit the online application form before the due dates or if they submit it after the due date they have to submit it with the late fee. Candidates need to fill all the details correctly and must pay application fee. Candidates have to upload all the required documents in the form. After filling the form candidates must take a printout of the form for future references. Scanned image of the signature in the prescribed format. The online application fee for all the candidates is Rs. 570/- (including processing fee). Candidates can make payment through any of the mode i.e through online (via Credit card/Debit card) or offline (AP Online Centers /e-Seva Centers, Mee Seva Centers) mode. Candidates can still register for the exam after the due date with a late fee of Rs. 10000 (plus 450 registration fee). Candidates must be an Indian national. Candidates must be a resident of Andhra Pradesh. Candidates must have three years bachelor degree in any discipline with minimum 50% marks (45% in case of SC/ST candidates) from recognized university. Final year appearing candidates in qualifying exam are also eligible. Candidates must have three years bachelor degree with minimum 50% marks (45% in case of SC/ST candidates) from recognized university. Candidates must have Mathematics as one of the subjects in 10+2 or degree level. The exam will be conducted in offline mode. Total 200 questions will be asked. Total marks of question paper will be 200marks. Exam duration will be of 150 minutes (2 hours 30 minutes). The question will be asked in English and Telugu accept in Section-C. Questions will be asked in three sections in the exam. Candidates will get the admit card from the official website at the notified date. No hard copy of admit card will be sent to any candidates. Candidates have to download their Andhra Pradesh ICET admit cards from the website by using registration number, date of birth or password. Candidates must carry their admit cards to the exam centre. Answer keys to the AP ICET 2019 exam will be released after few days of commencement of the exam. In case of any objection towards the answer key, candidates can file their objection within the time limit provided by the concerned authority. AP ICET 2019 result will be announced in the 2nd week of May 2019 (expected). Candidates can check their result through the online mode. After the declaration of result shortlisted candidates will be invited for ICET Counseling. Candidates will be shortlisted on the basis of scores obtained in the entrance exam. At counseling these candidates will be allotted seats in the various colleges of Andhra Pradesh. AP ICET (Andhra Pradesh Integrated Common Entrance Test) is a state level entrance exam conducted for the admission into Post Graduate regular courses in the colleges of Andhra Pradesh. AP ICET is conducted every year by Andhra University, Vishakhapatnam on the behalf of Andhra Pradesh State Council of Higher Education (APSCHE).